What Is a Co op? What Is a Co op Apartment in NYC? One of the first questions home buyers have when they start searching for an apartment in New York City is what is a co op? To be more specific, what is a co op apartment in NYC? We’ll explain in this article what is a co op and how this very unique form of living came to be so prevalent in New York City. What Is a Co op with Condo Rules in NYC? When New Yorkers ask what is a co op, they are not wondering about chicken farming cooperatives. They are almost always asking what is a co op apartment in NYC. A co op apartment, also known as a coop, a cooperative, or a co-operative apartment, is a form of living that is very common and unique to New York City. When people ask what is a co op, they are wondering why this seemingly normal looking apartment on the market for sale is labeled as such. They have usually seen other apartments labeled as condos, and sometimes even just as an apartment (learn the difference between a condo vs apartment in NYC). A co op is a form of housing where a cooperative corporation owns an entire apartment building. The cooperative corporation is run by a board of directors elected by the shareholders. Shareholders are issued a stock certificate and a proprietary lease to occupy a specific apartment in the building. 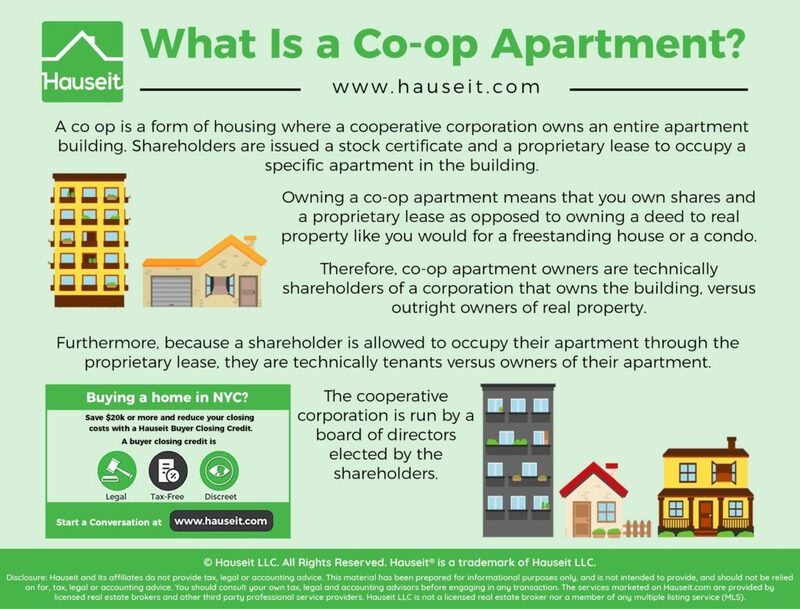 Therefore, co-op apartment owners are technically shareholders of a corporation that owns the building, versus outright owners of real property. Furthermore, because a shareholder is allowed to occupy their apartment through the proprietary lease, they are technically tenants versus owners of their apartment. Co op housing in NYC can be purchased on the open market just like buying a condo in NYC. Cooperative real estate can be found on all property search websites or through your buyer’s broker just like condos, townhouses or multi-family properties. In fact, there have historically been many more co-op apartments for sale vs condo apartments. After the rental conversion boom of the 1980’s, when many rental buildings were converted to co-operatives, the proportion of co ops vs condos in New York City reached as high as 75% coops to 25% condos. Today, most new construction consists of high end condominiums, so the ratio of condos vs coops is becoming more equal. Buying a coop in NYC will be a bit more complex than buying real property such as condos or townhouses. That’s because you’ll need to submit a lengthy coop board package and pass a coop board interview in order to have approval from the coop’s board to buy in the building. Furthermore, many coops have stricter financial requirements than your typical mortgage broker or bank who is arguably taking more risk by loaning money for your purchase. It typically takes at least two to three months to close on a co-op once you have a signed contract. While it’s possible to buy a coop without a broker, we highly recommend that you find a great buyer’s agent who will guide you through the complex coop buying process. 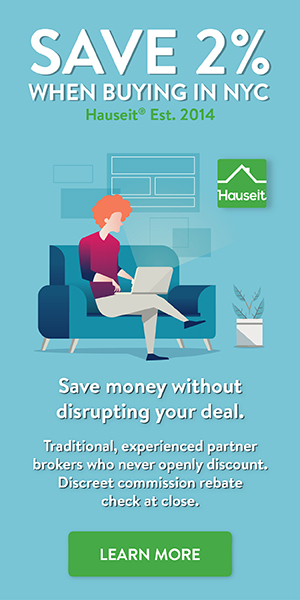 Not only is having a buyer’s agent free, you can also receive a discreet commission rebate from one of our highly rated and experienced partner brokers. Not only would you have a senior, veteran buyer’s broker guide you through the coop buying process for free, they’d also pay you $20,000 or more out of their commission. Best of all, because all of our partner brokerages are brand name, traditional real estate firms who never openly discount or tarnish their reputations in any way, the seller and listing agent won’t automatically know you’re getting a better deal! This way, you can save money on your purchase without risking your deal. It’ll be our little secret! Not only are broker commission rebates completely legal in NYC, they are encouraged by NY State’s Attorney General! Here is an open letter to the real estate community from NY Attorney General Eric Schneiderman encouraging rebates and competition in the marketplace. Sometimes you’ll see listing agents market a property as a co op with condo rules. These properties are frequently listed as a condop. Don’t be confused however, a condop is usually just a building that has separate commercial condos on the ground floor and all of the residential units organized as a co-operative corporation. Therefore, a condop is simply a coop with commercial condo neighbors in the building. While some condops may indeed have more flexible, condo like rules, you should not expect that to be the case. A condop can have house rules that are as strict or more strict than your regular coop. Often times, listing agents will market a coop as a co op with condo rules simply because they want to emphasize a relatively flexible sublet policy. This could indeed be an advantage as most coops prefer full time residents versus part time residents or subletters. However, keep in mind that even if a coop is more flexible and allows subleasing, there will usually be more fees payable to the building to sublet a co-op apartment versus renting out a condo apartment. Furthermore, most co op rules and regulations prohibit subleasing for more than 2 out of every 5 years, and some coops require a minimum period of residency before a shareholder is allowed to sublet their apartment. Only very rarely will you see a coop that allows unlimited subletting from day one. If you find one of these, it may indeed be a good deal given that coops are generally 10-40% cheaper than condos of comparable size and quality. Is buying a coop a good investment in NYC? 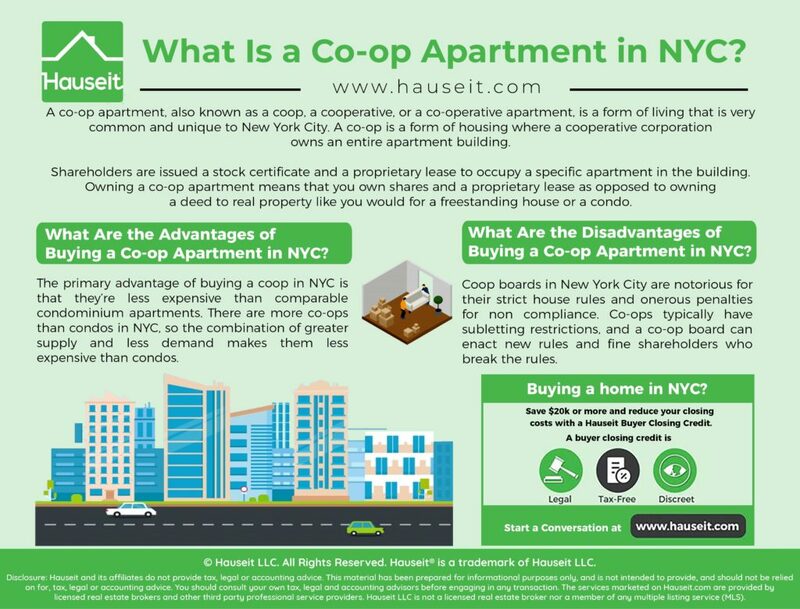 The primary advantage to buying a coop in NYC is the lower cost of cooperative housing versus comparable condominium apartments in New York City. Because coops aren’t considered to be real property, are more difficult to rent out and have a more difficult coop buying process, investors and foreign buyers usually shun coops in favor of condos. This has muted the price appreciation of coops vs condos which can make a dramatic difference in affordability for working New Yorkers. Besides affordability, another reason some New Yorkers prefer coops is because of the ability to regulate and choose who your neighbors will be. That’s because coop boards have the power to reject prospective purchasers for any reason, without ever having to disclose the reason for rejection. While this power of rejection is typically only used because of legitimate concerns over the financial qualifications of the applicant, one can imagine that this power can also be used nefariously to discriminate against people they simply don’t like. Worse still, it’s almost impossible to prove that a co op board was discriminatory because they are never required to disclose a reason for rejection! This is dramatically different than a condo building where the only way a condo owner can choose who his neighbor will be is to perhaps buy his neighbor’s apartment! If you’ve ever been annoyed at nosy or bossy neighbors, then you may want to avoid having to live in a co op. Coop boards in New York City are notorious for their strict house rules and onerous penalties for non compliance. Furthermore, because a coop board is just like a board of directors of a regular business corporation, they have tremendous power over the tenant shareholders and life in general in the building. They can enact new fines and rules, and punish tenant shareholders who break the rules. Often times there is no way to appeal a fine even if you feel that it was unjust. Would you really sue your own building over a small fine? It’s a tough situation that many co op shareholders have to deal with on a regular basis. Furthermore, be very careful of who is on your coop board. Often times, these are small minded people who have never had power before or in any other context. Therefore, coop board members have a tendency to want to cling to power. We’ve heard too many horror stories of coop board members abusing the supposed free and fair election process by coercing shareholders to vote for them. What’s worse, sometimes you will see a real estate broker who is a member of the coop board. These real estate brokers will leverage their power to approve or reject applicants to effectively coerce other shareholders in the building to choose them as their listing agent when they need to sell their coop apartment.